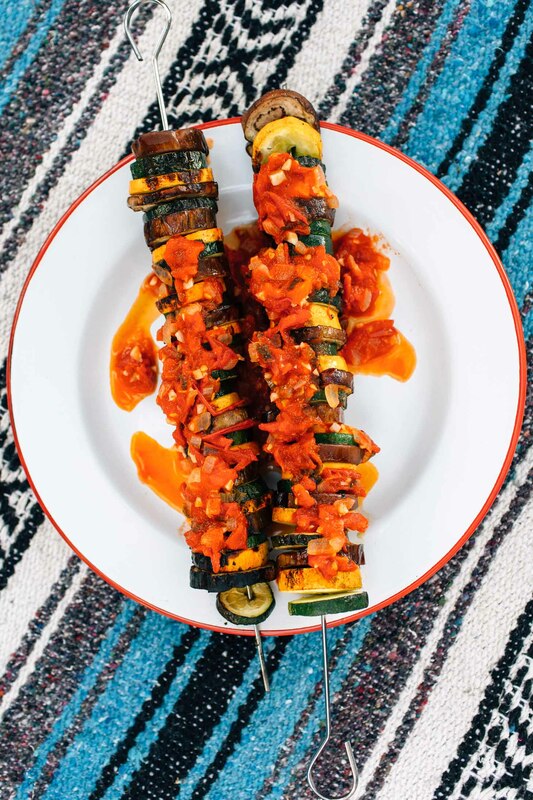 A vegan kebab with a French twist, this campfire grilled Ratatouille is a great way to incorporate some vegetables into your camping diet. From the French countryside to Pixar movie fame, Ratatouille is now coming to a campfire near you! This summery dish of zucchini, squash, and eggplant is typically prepared in an oven but can be easily adapted to be grilled as kebabs as well. Just slice, skewer, and roast over the open fire. 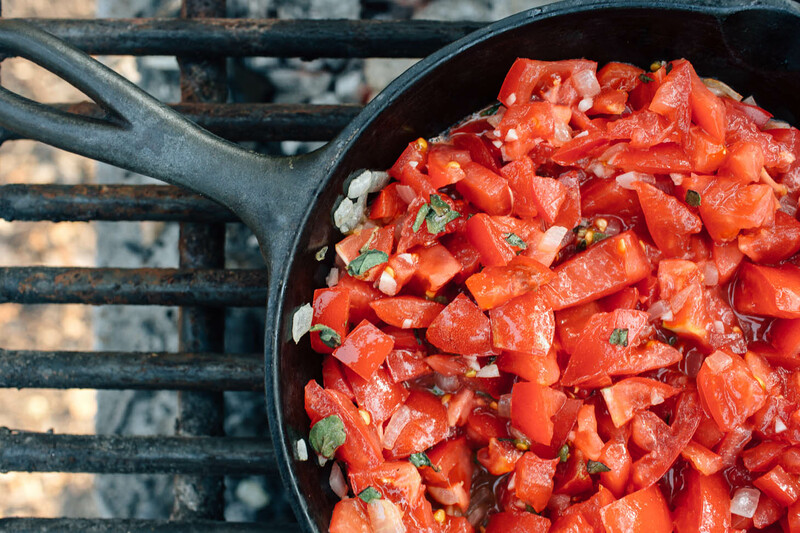 The tomato sauce can be prepared in a small pan over the fire or separately on a camp stove (or made ahead of time at home and warmed at the campsite). These grilled vegetable kebabs can either be your main dish or as a side. Either way, it’s a great way to incorporate some flavorful vegetables into your camping meal. So this summer, throw these ratatouille kebabs on the fire and enjoy. ‣ As with any kebab recipe, there’s not a lot of cookware to dirty. So this meal is extremely easy to clean up after. ‣ It also works as a low-stress side. You won’t need to tie up a bunch of pots or pans, and it can be cooked over the fire you already have going. 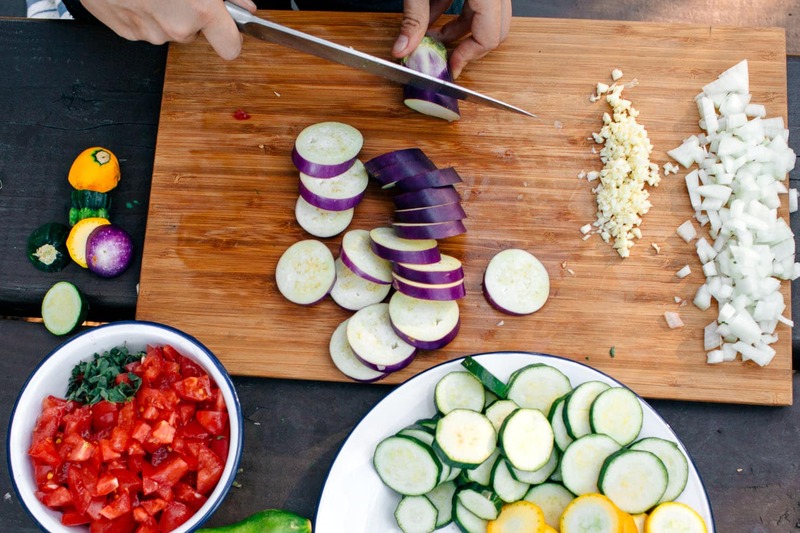 ‣ While chopping your vegetables into uniform slices presents a bit of prep work, it’s a simple enough of a task that it can be delegated to the less culinarily inclined members of your party. ‣ A little bit of olive oil goes a long way. Before putting your kebabs over the fire, make sure pour a line of olive oil down them and rotate to coat evenly. ‣ Zucchini, squash, and eggplant are all great camping vegetables that can handle minimal refrigeration. If you want some durable vegetables that will last a few days, these are perfect. ‣ When selecting your zucchini, squash, and eggplant, try to get similar diameters. The closer they are, they more evenly they will cook over the fire. ‣ Chinese eggplant can sometimes be tricky to find. You can absolutely use regular eggplant instead and just cut it to fit, but the kebabs won’t have that pleasing uniformity. 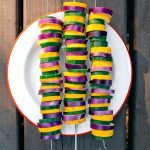 ‣ We used metal skewers for these kebabs because they are reusable and won’t burn. But if you plan on using wooden skewers, just be sure to soak them in some water beforehand. There shouldn’t be much wood exposed with this recipe anyways, but better safe than sorry. 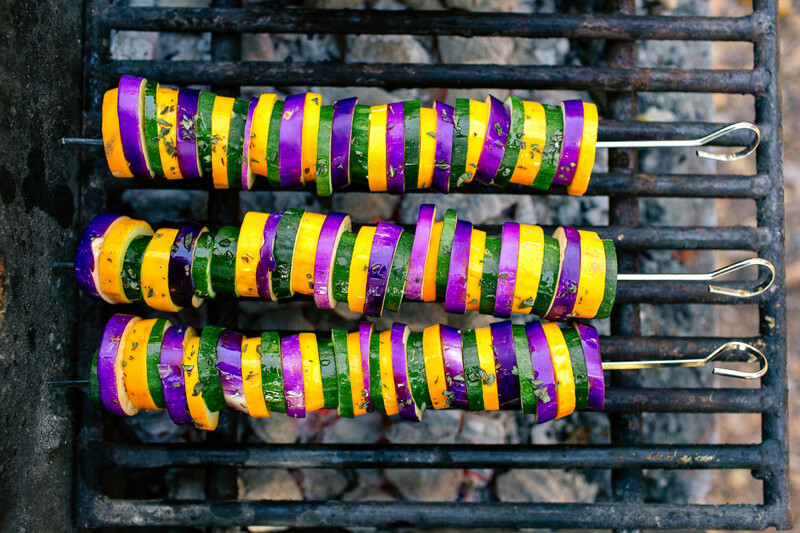 These kebabs are a colorful and healthy summer grilling recipe. Since it's vegan and gluten-free, this is an easy camping meal that everyone can enjoy! MAKE THE KEBABS: Meanwhile, slice the zucchini, squash, and eggplant into slices ½ inch thick. Assemble the kebabs onto skewers, alternating each vegetable. Drizzle with the remaining 1 tablespoon olive oil and sprinkle with salt to taste. Grill the kebabs directly on the grill grate over the fire, turning frequently so all sides cook evenly. Cook about 20 minutes, or until all the veggies are tender. Serve immediately topped with the tomato sauce. We originally published a version of this recipe in July 2015 on the Cotopaxi Aventuras Journal. This is looks really yummy. This is really looks yummy. Love this! Perfect grilled dish for summer camping.